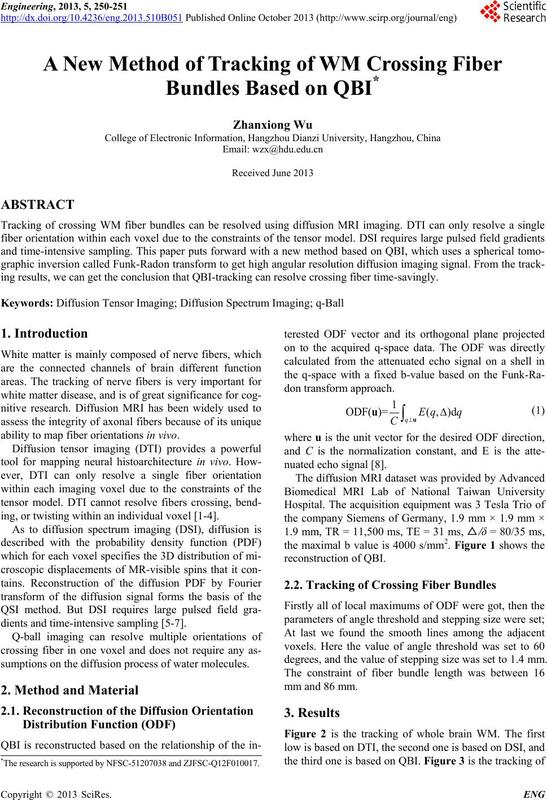 ing results, we can get the conclusion that QBI-tracking can resolve crossing fiber time-savingly. ability to map fiber orientations in vivo. ing, or twisting within an individual voxel [1-4]. dients and time-intensive sampling [5-7]. sumptions on the di ffusion p r oc e s s o f water m olecules. degrees, and the value of stepping size was set to 1.4 mm. *The research is supported by NFSC-51207038 and ZJFSC-Q12F010017. ronal view; (c) Axial view. Vol. 66, 1994, pp. 259-267. Beyond,” Radio Graphics, Vol. 26, 2006, pp. 205-223. Cortex, Vol. 41, No. 3, 2005, pp. 354-363. Strategies-Atechnical Review,” NMR in Biomedicine, Vol. Medicine, Vol. 54, 2005, pp. 1377-1386.